Exadigm's Mate Plus Cellular terminal is a next generation POS terminal which is equipped with a CDMA / 1XRTT / GSM / GPRS Radio Modem and utilizes 128-bit TCP/IP SSL encryption. Exadigm's CDMA and GSM Module attaches easily to any of our Mate Plus products and utilizes a CDMA / 1XRTT / GSM / GPRS Radio Modem for wireless capability without a network. The modem allows for sub 6-second transaction times. The Mobile Mate Plus Cellular Terminal's specification are listed below. The specifications are subject to change without any prior notice. Please contact your sales representative for a detailed product description. CELLULAR MODEM Available with CDMA / 1XRTT, GSM / GPRS, 802.11b, 900 MHz. 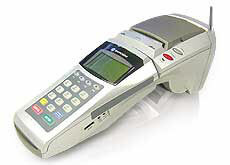 The modem allows for sub 6-second transaction times. ACCESSORIES Belt clip, car adaptor, batteries, multiple battery charger, terminal cover/case, serial port cables.